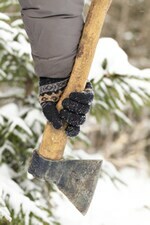 How much wood can your woodsplitter split if your woodsplitter's frozen solid? If the hydraulics are frozen, you're not going to be splitting at all. There’s a reason why everyone splits firewood in the fall. It’s way too cold in the winter. Some folks can get away with splitting everything in the fall in preparation for winter; however, if you're low on firewood during the darkest days of the year, it’s possible to breathe life into your frozen log splitter by taking a couple of precautions. If you own a gas log splitter, be extremely careful where you use it. Sure, you could haul it into your barn or garage to stay warm and dry; however you’ll also be warming your lungs with deadly exhaust fumes. Operating a gas log splitter inside is like running your car in a closed garage. It emits carbon monoxide – an odorless gas capable of silently killing you and your family. After all, who's going to stack the firewood if you’re all a bunch of stiffs? If you still want to split wood indoors in your favorite camo pajamas, we recommend purchasing an electric log splitter instead. You don’t have to worry about fumes or gasoline, making it a safer and cleaner way to split logs indoors. If you store your log splitter outside in a frozen tundra, don’t expect it to work properly come springtime. The hydraulic oil inside quickly converts to a jelly-like sludge when the temperature plunges below 41 degrees. You may be tempted to switch to a thinner oil, but you’ll just end up overheating your log splitter when you use it next fall. To ensure your splitter will start and run properly, your best option is to store it with a magnetic block heater installed. If it won't stay warm enough after you start it, you can always leave the block heater on during use. So, the next time you run low on firewood in the winter, remember to resuscitate your log splitter before braving a blizzard with an ax. It's a lot easier to stack firewood without frostbit fingertips. Cold Weather Log Splitting Tips.. Our Power Equipment Direct how-to library can help you learn about Understanding the Janka Scale, Proposition 65 Product Labeling and Sales Tax Information.